Among law firms, the innovations in service delivery needed to help business clients do more to protect themselves from legal risk with less expenditure — just aren’t happening. So say the numbers in two recent studies. 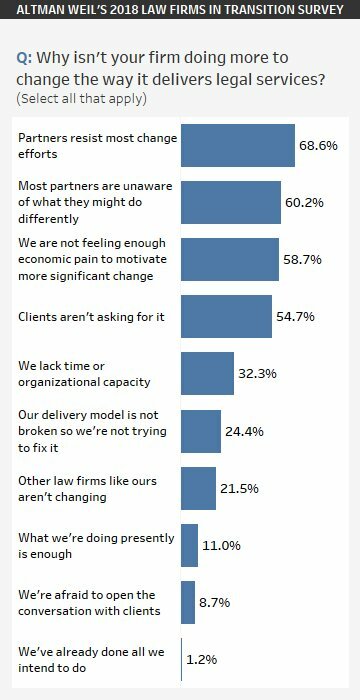 My own reading of those numbers: Law firms aren’t innovating much in legal service delivery because they don’t want to and don’t see it as all that important. ” … A majority reported seeing no or hardly any innovation. A plurality saw only a little. For 96% innovation was rare or nonexistent. “Over the past three years, how much innovation have you seen from law firms? “We asked another question that invited a more granular response. Over the past three years, had law firms done anything ‘significant and different’ to help alleviate ‘the pressures’ that the in-house lawyers were facing? This was purposely broad, an invitation to sweep in anything significant. “The response: 29% said they had received some assistance. There is of course more detail in each of these studies’ findings. But you get the idea. In an earlier post I described how Harvard Law School’s Professor David Wilkins had announcement five years ago that the legal industry had entered “the Global Age of More for Less”. These two surveys — one reporting law firm lawyers’ outlooks and the other reporting the client company perspective — find that law firms aren’t responding to this urgent need. Meanwhile the legal system’s skyrocketing demands drive company budgets for lawyers persistently upward. As a practicing lawyer I don’t question that businesses need the legal analysis and advocacy of skilled attorneys. But the legal system’s proliferating demands aren’t abating any time soon. And as someone who’s served as a general manager I can think of a lot better uses of the P&L than payment of constantly increasing legal fees. Law firms aren’t solving the problem. And — as the second survey above found — the in-house departments find themselves unsuccessful in changing law firms’ ways. Business owners and executives need to step in and give their lawyers some firm direction on this. Because innovation — and therefore cost reduction — isn’t coming from inside the legal industry itself.